In a discussion with guest speakers in one of the courses I’m teaching, one of the guests brought up the issue about student blogging. She commented that she does not leave comments on her student’s blogs. This is in part because of the teacher – student relationship. There is an issue with a sense that anything that the teacher says is a form of evaluation, and under the various student privacy legislations (different names same ideas in Canada and the US), student evaluation data cannot be shared in a public form. This got me reflecting on my practice as an educator. I regularly comment on my student’s blogs. It is actually expected in one of the courses I’m currently teaching. I also will tweet out links to student’s blog posts if I think they have done a particularly good job saying something, or if the are blogging about one of my guest speakers. I should not that although I do leave comments on some of my students’ blogs, I never leave negative comments about my students’ work on their blogs. I don’t typically provide constructive feedback as comments on their blogs either. That is something that I usually do via private email. This let’s my students know that I am reading their blogs, but also helps to give them a gentle (or not so gentle) nudge as to how they might improve their blogs. When I began teaching this last year, my view of my value proposition as a teacher changed. Previously I saw my technical expertise, my domain expertise, and my past work/industry experience as my value proposition. Now what I add to that is that I’m a networked-scholar. I have lots of connections. I’m active on social media. As a result, part of the value that I bring to the classroom is through the connections I can help my students make. My friends and networks allows me to bring the world into my classroom. I want to not just bring it in, but I also want to help my students navigate in the world outside of the classroom (or at least those that chose to do so – whenever I design a course blogging publicly is an optional activity). I love teaching and encouraging blogging because it is something I do a lot of and something that I believe I do well. I’m not just academically literate in blogging, I’m also personally and practically literate in the topic. I get what it means to be a blogger and I get what it means to interact within the blogosphere. This is in part what I want to share with my students. If I cannot leave comments on my student’s blog posts, then I feel like I’m not really engaging with them in that media. I’m also not modeling to them how to leave comments on other people’s posts, and how they might interact with other bloggers. It is part of what it means to be blogging on the public internet. But I’m not justifying my reason for commenting on my student’s blog posts without reflecting on the appropriateness of it. I also don’t think that the situation is the same for all professors or for all courses. In some cases it might not be appropriate. There might be that sense of power imbalance that is shifted to the public online space. So, I wonder, dear readers, what do you think? 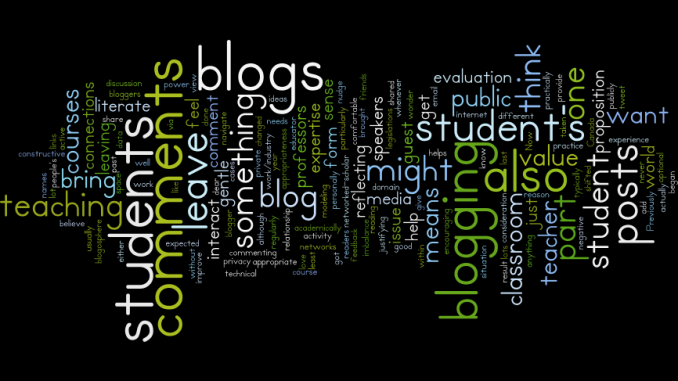 Do you think that professors should feel comfortable leaving comments on students blog posts? What needs to be taken into consideration before leaving a comment? I find it rather absurd that a teacher would not comment on a student blog. If we want students to see writing as having real value in the real world, then making the conversation only situated in the classrooms seems counter-intuitive to me. If what you cite is policy is true, then chalk up another absurd element of an educational system. But where I really do see a valid argument is the sense of the power imbalance and the role of assessment and evaluation. I don’t ever want to be seen as assessing or evaluating my students in a public forum – or at least I worry about it – I want to provide constructive feedback and encouragement, but don’t want that to feel like I’m giving a grade or assessment from that perspective. One thing I’m not sure I mentioned in the post that I should have is that I always tell students that they are free to delete or not approve my comments …. my comments are for them to share as they wish to share since it is their blog after all … so I guess in this way they have complete control over what gets shared publicly. As a learner I think professors should comment on learners blog posts as it transforms the blog from a static space to an interactive community. A few comments can make a learner realize they are writing for a global audience – for many like myself it is incredibly motivating. Also it is nice to have your ideas be challenged.